I set up my Workshop and Showroom in 1972. 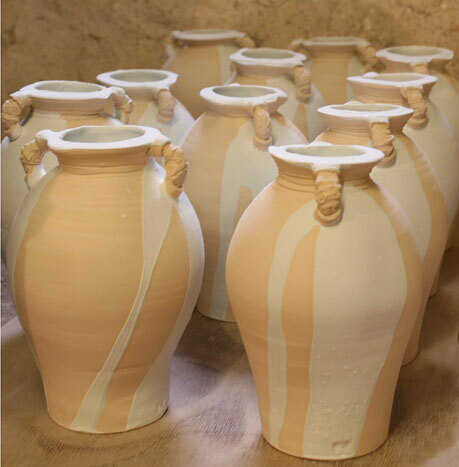 For many years I made a wide range of functional pottery, coffee sets, storage jars, pots for plants, specialising in large planters and breadcrocks, as well as individual work, selling both in my showroom and in craftshops and galleries. I am now based in my workshop at my home in Windermere and sell my work to galleries and craft shops across the U.K as well as through the website. I also sell directly at various ceramic fairs and exhibitions throughout the year, which are listed on the events page. Although I still make functional pottery I also like to work in a freer way with more individual work and a wide choice of materials. Most of my work is thrown on the wheel. I like the process of creating in action rather than stillness, and the form and detail produced by that action. I like to create strong contrasting textures of clay and glaze, often using powdered clays on the wet thrown body to build up a heavily encrusted surface. I have a taste for ancient and primitive pottery, partly because often the means of production were direct and very simple, but also because ancient artefacts are disconnected from their time and immediate function, which gives them great peacefulness. Ancient Greek culture and holidays in Greece have influenced my work. The pale sandy clay that I use and the aquamarine barium glaze that I like to pour over the surface gives me a feel of the place. My work is mainly stoneware. High fired iron bearing clays are fired in an electric kiln to 900°C for the first firing and then the glazed pottery is fired up to 1270°C. I also like to Raku fire. This is where pots are fired very rapidly in a small gas kiln before being lifted out red hot, and buried in sawdust. The ensuing combustion blackens the exposed clay and produces rich, iridescent colours in the glaze. I am a professional member of the Craft Potters Association and a member of the Northern Potters Association. ©John Kershaw Studio Pottery. Website design by Catherine Byrne.